"विशाल ब्रिटिश इलाके के बीच में खोये, ये बंदरगाहों कोइ लाभ के नही। बल्कि, वे फ्रांस के लिए भावनात्मक मूल्य के हैं।"
↑ In France, the official name Établissements français dans l'Inde was mostly found in official documents. 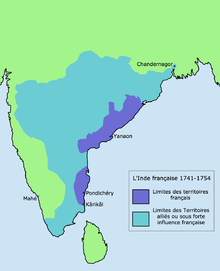 The expression Inde française was not often used as it was found too grandiose since the territory of French India was minuscule, particularly compared to British India. Among the population and in the press, the expression Comptoirs de l'Inde was (and is still) universally used. However, a comptoir is a trading post and therefore not a very appropriate word to denote the French possessions in India, which were colonial possessions rather than mere trading posts. ↑ Jacques Weber, Pondichéry et les comptoirs de l'Inde après Dupleix, Éditions Denoël, Paris, 1996, p. 347. ↑ Holden Furber, Rival Empires of Trade in the Orient, 1600-1800, University of Minnesota Press, 1976, p. 201. ↑ Philippe Haudrère, Les Compagnies des Indes Orientales, Paris, 2006, p 70. ↑ Asia in the making of Europe, पृ॰ 747 . ↑ The Cambridge history of the British Empire, पृ॰ 66 . Sudipta Das (1992)। Myths and realities of French imperialism in India, 1763–1783. New York: P. Lang. ISBN 0820416762. 459p.